The co-founder of 2d Cloud discusses her latest graphic novel, her essay ‘Getting Divorced in Comics’ and more. 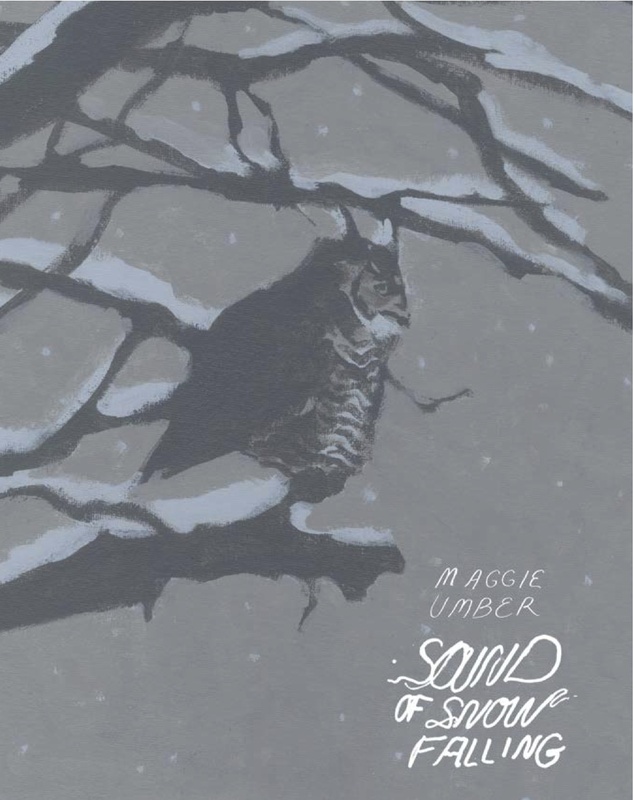 Maggie Umber’s most recent graphic novel Sound of Snow Falling is a wordless painted graphic novel. 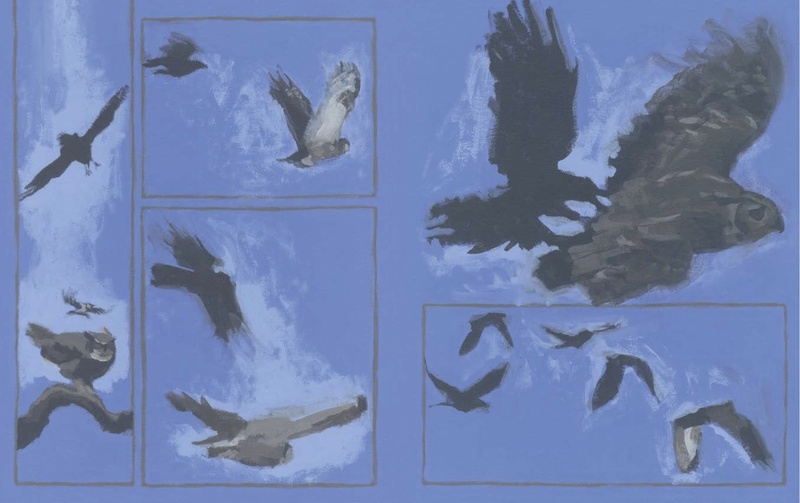 A beautiful and meditative look at a pair of great horned owls, it may her most recent comic, but in many respects it’s her earliest comics work and is a project that she has been thinking about and working on for many years. It is available now from 2d Cloud. This book is Umber’s second graphic novel after 2015’s Time Capsule. She is also the co-founder of 2d Cloud and she recently stepped down as Associate Publisher – one of the many hats she wore at the publisher, events that she discusses (among other topics) in her much-discussed essay “Getting Divorced in Comics.” Umber spoke about her book, the essay, her short comic in the upcoming anthology Warmer, which comes out next month. How do you describe Sound of Snow Falling to people? 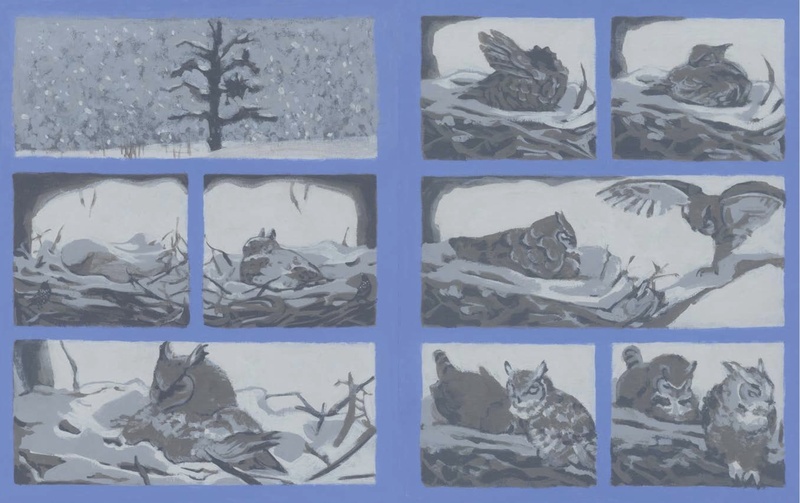 It’s a full-color, wordless, documentary-style graphic novel that follows a pair of great horned owls through a single winter. What was it about owls that you found so interesting? Was it visual? Behavioral? Both visual and behavioral! Owls look so marvelous. They have the giant eyes that are in front of their face. Birds bodies in general are very attractive. The dynamism of their wings and the physics of their flight is fascinating, like how a bird uses its tail as a break and as a rudder. Birds of prey like owls cause conflicting emotions for humans. They are cute and cuddly looking but they will eat your pet cats and rabbits. Also great horned owls range in their personalities widely from aggressive to timid and in the kind of food that they prefer. Their activity is centered on times of low-light levels, so that is mysterious for diurnal creatures like humans. So a lot of points of interest! What material did you use to make the book? Acrylic? The storyboards were pencil on paper. The final pages were acrylic on canvas panels. How much research was involved in making the book and did the research change the book or what you were trying to do? Time Capsule was an exception, because I was decompressing from Sound of Snow Falling, but in general I do a lot of research for my books. “Write what you know”, I believe that is true. When I choose a subject, I learn as much as I think I need to know to convey the reality of the story. 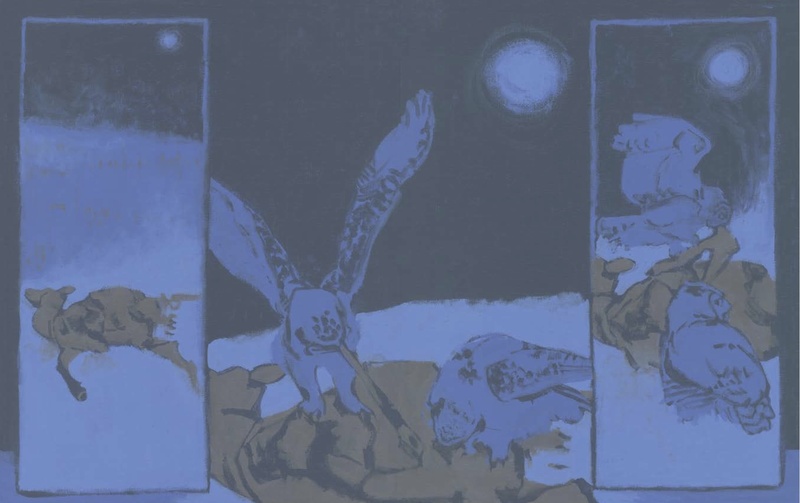 For a book like Sound of Snow Falling, the research leads the narrative and develops the book. How long did it take to make the book and how much of that time was figuring out just how to tell it, because this is a wordless story. In 1998 I did a research paper for my high school biology class from the perspective of a female great horned owl. Then in 2008 I did a 5 page comic version of it for 2dcloud’s Good Minnesotan #3 anthology. In 2011 I began the graphic novel and in 2014 I completed it. Telling a story without words is just another method of constructing narrative. Not very many cartoonists focus on that, so there is a lot of uncharted territory. I was showing Raighne the first draft of Sound of Snow Falling graphic novel that I hadn’t added words to yet and he said, “Why add the words? I can read it the way it is.” Which delighted me, because I generally prefer to work without words. So for that book, I just fell into it by chance. There was no effort. It’s a beautiful book but the color does complicate some of those storytelling choices. Did you ever think, I should have picked a diurnal bird? No, it was always a book about great horned owls. However, there are diurnal birds and moments in the book. For example, I painted woodpeckers and crows finding food and making nests. I included them to show the transition of the season and give a sense of time and place. But even the daytime scenes are dim because the book takes place in winter and winter is generally more cloudy than other times of year. For me the color in Sound of Snow Falling doesn’t complicate the storytelling, it simplifies it. I like to pick out limitations as I make a book. I make up rules and those rules create the book’s style and narrative. What was the production process like? Was it a challenge to reproduce the art in just the right way? For every book production design is a challenge. Raighne, my publisher and editor, is also my production designer. We collaborate closely on almost every comic I make in terms of the final product. A particular challenge for Sound of Snow Falling was that I didn’t design for bleeds. I had only been making mini-comics and never a graphic novel so I was inexperienced. I did learn better habits as the years went by, but I wanted to be consistent throughout the entire process. The lack of bleeds created a big problem for Raighne in InDesign. He had to do a lot of work on his end to resolve it. There were delays in me finishing Sound of Snow Falling. Then when it was finished there were delays because we wanted to get 2dcloud setup with a distributor before publishing the book. During production there were delays because of the issue with bleeds and CMYK color correction. So the book took 4 years to make and then there was a 3 year gap and even another graphic novel – Time Capsule – between finishing and publishing. Why did you ask James Duncan to write a forward for the book? James Duncan is an owl expert, an excellent writer of books and he likes my artwork. It was a perfect fit. His foreward gives the book a context. Also, it is a big help to Ingram our distributor who is selling Sound of Snow Falling to bookstores. It helps them to market the book. That is also why I worked so hard to get Julie Zickefoose to write a blurb. She’s a bird expert, a popular writer and well known in the birding community. It gave our pre-orders a big boost. It’s important that these scientists are able to look at my work and say, yes, this is accurate and representative of birds and of great horned owls. I’m not a scientist, so me saying that it’s been researched and is documentary-style has less weight. You have a short comic, “Pollination,” in the new collection Warmer. Do you want to talk a little about the book and the comic? Warmer is a poetry comics anthology about climate change. It’s edited by Madeleine Witt and Andrew White. There are 19 cartoonists, all of them doing interesting work in the field of altcomics. Madeleine and Andrew [ran] a Kickstarter campaign to raise funds to pay for the printing and plant costs of the book. My comic “Pollination” is a 10 page watercolor comic. It focuses on how a warming climate affects the relationship between tulip trees and honey bees and their reproductive success. Raighne did the production design on this comic and also used my watercolors to make a title and final page. He gave it the title “Pollination” and he is the one who thought up the title of my graphic novel Sound of Snow Falling. Madeleine and Andrew reached out to me because of my graphic novel Time Capsule. Time Capsule is abstract and broad. It focuses on the broken language and culture of the plant and animal kingdom and its eventual demise. Pollination is a more straight-forward comic narrative about climate change. Right now I’m working simultaneously on a black and white mixed media collection of short horror comics and a full color watercolor-based graphic novel about plants, which Pollination has planted the seeds for. Between this book and “Pollination,” you’ve been spending a lot of time working on comics about nature, finding a way to convey and communication how nature works. Obviously you like doing it, but how well do you think comic are suited for expressing and educating people in this way? I have no idea how well comics are suited for educating people about nature in the way that I make them. I don’t make my comics to be teaching tools. When I’m working, I concentrate on telling a story and conveying emotion. After reading my nature comics the readers can delve more deeply into the subjects by picking up other books. I hope I can get readers to look more closely and with more emotion at the things around them, like ants on a sidewalk or the tree in front of their house, and wonder about the everyday lives of those beings. You wrote an essay recently which got a lot of attention, “Getting Divorced in Comics.” Like a lot of people in comics, I read it, and I thought of Vera Nabokov in that it sometimes felt like you and Raighne were trying to be each other’s Vera. People were supportive. I got hundreds of emails, messages and comments and a lot of people came up to me when I was tabling at CAKE to talk about it. I was surprised that so many cartoonists across the gender spectrum said they were experiencing similar things. Also it was rewarding to hear people thank me for my work at 2dcloud and in the comics scene. I don’t totally see the comparison with Vera Nabokov. Neither of us has ever given up our career for the other person, is a body guard or has a car. Also no affairs. Maybe the intensity of their involvement with each other is what you’re driving at? I feel affinity for Shirley Jackson and Stanley Edgar Hyman’s working relationship, in the way that he was her editor and biggest fan. Raighne and I are great at being artistic collaborators. The root of the problem for us was being married while sharing a personal bank account and running a business together with opposing financial ideas. In the end, Getting Divorced in Comics is a snapshot of a moment in time. Things have changed a lot since that article was written. Having separated our bank accounts and elements of our personal lives has alleviated a lot of the strain in our relationship. When I wrote the article, I had quit 2dcloud. I’m not Associate Publisher anymore, Kim Jooha has officially taken over and she’s doing great things. But I’ve begun freelancing as 2dcloud’s bookkeeper and I’m also relocating with the company to Chicago. With the cheap rent at my new place, money from art gigs and 2dcloud, I won’t need a day job any longer. When I decided to move into Chicago, everything that I’ve been wanting fell into place. I’m thrilled to be moving into a bigger comics community, and to have roommates that are incredible cartoonists. Being a working artist and not having to work 3 jobs at once is a dream!!!! This has been a hard year, but things are coming together.